Where does one start when you were born in Detroit, Michigan, and raised during the great "Funk Brothers" era? Or, raised during the era of "The Originators of Music", as one scholar has described the Funk Brothers. I am not alone when I say that I could not escape the Sound of Motown. The world could not escape the great sound originated by the Funk Brothers. I have reverence for the Funk Brothers, and proudly proclaim that the late great James Jamerson was my idol. I began playing the horn in middle school for a short while, but soon picked up the bass guitar and wanted to make my bass sound like the sound of Jamerson's bass. As many musician will tell you, your musical instrument is a connection to one's self. But no one can match the heart beat demonstrated by Jamerson when playing his bass. It is all good though, because in attempting to capture the feelings of Jamerson while playing, the admirers of Jamerson began to develope their own unique style. Several bassist have come out of that era to make a legacy for themselves. I had the pleasure of meeting James Jamerson on one occasion. 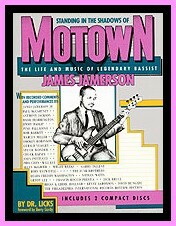 In the 70's, I was visiting Motown Studio B, and Jamerson was there. I will always treasure that memory. I've also had the opportunity to meet and chat with his son, James Jr. whenever he's in Detroit. "Thank you Dr. Licks for your excellent book!" When I was a young 19 year old kid, I auditioned for the late David Ruffin, during the time of his "Walk Away From Love" release. 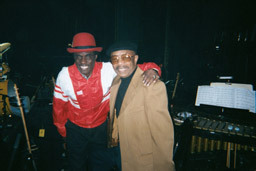 Ruffin hired me on the spot, and within that week, we appeared in Toronto, Canada. Our second show was the Apollo. Playing those bass lines on songs which had been recorded by Jamerson was pure joy. The book "Standing in The Shadows of Motown" was given to me a couple years ago as a gift by my sister. I took that book across the country during my travels at various concerts. When I learned that a portion of the filming would be at the "Royal Oak Theatre" I was determined to be there. For it has been long overdue for the "originators of the motown music" to receive their rightful place in the Motown history books. I can tell my grandchildren "I was there," and you likewise will be able to tell your children and grandchildren "I grew up in the era of the Funk Brothers." If by chance you hear me play bass InConcert, you will hear their influences, along with other styles of music such as jazz. Click here to enter the "Live Session"